Niels Feijen from Netherlands captured the 2009 French Open for his second Euro Tour win in a row. In the final the merited Dutchman defeated 15-year old Mario He (Austria) 9-4. The victory was worth €5000. Mario got €3300 for second place. The semi-finals saw Feijen defeating Poland's Thomasz Kaplan 9-4. Mario overcame Tour legend Ralf Souquet (Germany) by the same score. This was Feijen's first win in the French Open and fifth Euro Tour win overall, from ten finals. It moves him into fourth in the all-time list, only behind the German trio of Souquet, Oliver Ortmann and Thomas Engert. 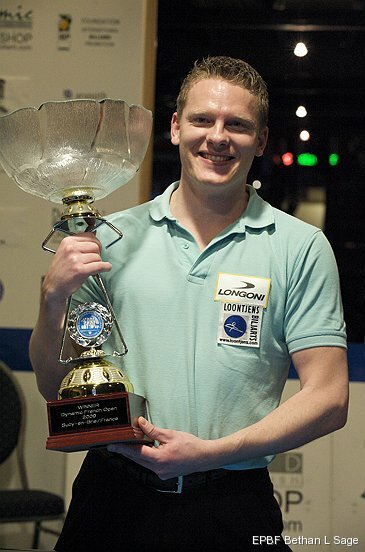 It was Feijen's second straight win, having also lifted the trophy at the 2008 Costa del Sol Open. Souquet won the two events leading into that event. Before that Johnny Archer (USA) was the last man to win back-to-back titles, in 2000. Defending champion Tony Drago (Malta) lost 9-8 to Rafael Guzmann (Spain) in the Losers Qualification. The win took Feijen from second to first in the season's first Euro Tour Ranking. Losing finalist Mario improved from 184th to 96th. Former leader Souquet dropped to second and Nick van den Berg slipped to third. The tournament was played 12-14 February at the Leader Billard Club, Paris, France. It was the first event of seven on the 2009 Euro Tour. Next up is the Italy Open which runs from March 25-28 2009.